I received an unexpected email and phone call last Friday…. 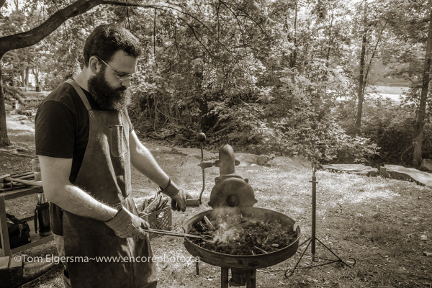 Was I available to do a blacksmithing demonstration at an event the following day? Apparently the blacksmith that usually demonstrates at the Happening at the Forty event in Grimsby, ON had something come up at the last minute (I’m not sure exactly what, but is sounded like an injury). One of the big parts of the event was an encampment of War of 1812 Reenactors, and they were quite disappointed that they may not have a blacksmith in their camp. Despite the short notice, and a bit of a scramble to gather together tools, etc, it made for a very enjoyable day out for me. I’m surprised (being from the Niagara region) that I’d not heard of this event before – it was fantastic! Will definitely have to attend with the family next year. This was my first time being amongst period reenactors, and I found them to be a very friendly and welcoming group. It amazes me how much time and effort they put into it. Researching the historical accuracy of the wide array of ‘stuff’ they have (uniforms and civilian clothing, tents, camp gear, etc). I was particularly interested in the Surgeon’s tent. He had a table full of replica surgical tools, many having to do with amputations. Every one of the tools was something I’d enjoy trying my hand at making. Time to stock up on some wrought iron and get researching. I’d love to do more of this sort of reenacting thing myself – at some point in time. Although I’m not quite sure how to go about putting together a period-specific traveling forge set-up…. Again, time for some more research. My friend Mike ended up coming out for a portion of the day, to help talk to people and also to be a striker for me. Despite the fact that we haven’t worked together in a while, we quickly found our rhythm as a smith & striker, and pounded out a nice cooking utensil for one of the reenactors. Anyways, I wanted to pass along my thanks to the event organizers. I had a wonderful time. I’d also like to wish my fellow smith, Rob, (who I filled in for) a speedy recovery from whatever injury it was that kept him from working the past weekend. Lastly, I’d like to thank professional photographer Tom Elgersma for giving his kind permission to use the above photo of me. As usual, I was so busy working all day that I forgot to take any photos myself! Sunday evening before a holiday, I’m rummaging through my workshop trying to find all the bits and pieces I’d need for doing a public demonstration; trying to cram too much (very heavy) stuff into the back of my truck – all on my own. As a piece of steel stock drops through the holes in the bottom of a milk crate, darn near breaking my toe, I ask myself “why am I doing this?’. It’s because of the people. You really do meet some tremendously excellent people when you’re out and about in public, demonstrating this craft. Some are just amazed by the process of manipulating incandescent iron. Others have an interest in antique tools, machinery, etc and really appreciate seeing how it was all made. Many have a story to tell about some relation that was a blacksmith or farrier. But virtually everyone that comes by takes some interest – and that’s rare these days. It’s really neat for someone my age to be told, by a senior, that I remind them of their grandfather. And its amazing to see kids take an interest in anything that’s not on their iPhone! The kind people you meet along the way really does make it worth the effort to drag several hundred pounds of equipment out and back to do a demo. I think its something every smith should do at some point. Thank you to the Niagara Historical Society & Museum for inviting me back to their Past is Present event this year. And thanks to all the nice folks who stopped by for a chat. It made for a very enjoyable day out!